Which one of the following best describes the properties of a solid? Fixed volume, fixed shape and not free to move. Fixed volume, no definite shape and free to move. No fixed volume, fixed shape and not free to move. No fixed volume, no fixed shape and free to move. What type of substance has no fixed shape, no fixed volume and is not free to move? Liquids do not have a fixed shape. Solids have no definite shape. Gases have a definite volume. The particles in a gas are not free to move at room temperature. Increasing the pressure on a gas usually decreases its volume. Doubling the pressure on a liquid will halve its volume. Decreasing the pressure on a solid significantly reduces its volume. Increasing the pressure on a solid will decrease its mass. In the experiment showing the diffusion between ammonia (NH3) and hydrogen chloride (HCl), which of the following statements is FALSE? Hydrogen chloride travels the furthest because it is less dense. A white cloud of ammonium chloride is formed when the two gases mix. The reaction takes place at the end nearest the hydrochloric acid. Both ammonia and Hydrogen chloride must be very concentrated solutions. 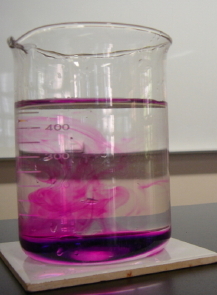 For the diffusion of potassium permanganate in water, which of the following statements is FALSE? The diffusion occurs very quickly, reaching completion in less than a minute. The bottom of the container becomes coloured first. When the diffusion is complete, all of the liquid is the same colour. The diffusion will take place faster if the mixture is heated. Which one of the following statements best describes Boyle's Law? For a fixed mass of gas at a constant temperature, the pressure of the gas is inversely proportional to its volume. For a fixed mass of gas at a constant pressure, its temperature is proportional to its volume. For a fixed volume of gas at a constant temperature, the pressure of the gas is inversely proportional to its mass. The temperature of a fixed mass of gas at a constant pressure is inversely proportional to its volume. Which one of the following does NOT express Boyle's Law? Which one of the following expresses Charles' Law? The graph shows the volume left in a glass container after 60 ml of hydrogen chloride gas reacts with 40 ml of ammonia gas. Ammonia and hydrogen chloride are both gases, ammonium chloride is a solid. when all of the ammonium chloride is formed, there is still some unreacted hydrogen chloride gas left in the container. there is an excess of ammonia gas left in the container. 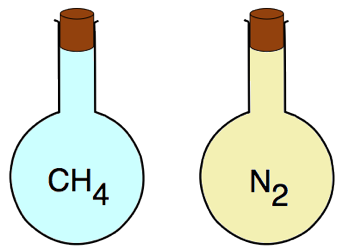 the two gases do not react in a 1:1 ratio. the product of the reaction, ammonium chloride has a volume of 20 ml. Which law states that "equal volumes of gases under the same conditions of temperature and pressure contain equal numbers of molecules"? If the volume of a fixed mass of gas is doubled while its temperature remains constant, what change will there be in its pressure? The pressure will be halved. The pressure remains the same. The pressure will increase by four times. The temperature of a fixed mass of gas increases from 100K to 400K. What will happen to its volume? It will increase by a factor of four (four times its original volume). It will decrease to a quarter of its original volume. If 4 litres of nitrogen gas at a temperature of 300K is expanded to 8 litres at the same pressure, what will the new temperature of the gas be? A gas has a volume of 250 cm3 at a pressure of 100 kPa. What will the new volume of the gas be at a pressure of 200 kPa if the temperature remains constant? An ideal gas occupies a volume V at an absolute temperature T. If the volume is halved and the pressure kept constant, what will happen to it's temperature? It will halve to T/2. It will increase to 2T. It will remain the same. It will increase to 3T. A sample of air has a volume of 150 cm3 at a temperature of 57oC. At what temperature will this volume be 250 cm3? The temperature of an ideal gas in a sealed container of volume V is increased from T to 3T. What will happen to the pressure, P of this gas? It increases from P to 3P. It decreases from P to P/3. It increases from P to 2P. Separate samples of methane and nitrogen gas have the same volume and each gas is at the same temperature and pressure. Which of the following statements is correct? Both gases have the same number of molecules. Each gas has the same mass. The densities of both gases are the same. Molecules of each gas have the same number of atoms. the amount of substance that contains as many particles as there are in 12 grams of the C-12 isotope. the amount of substance contained in 12 grams of carbon. the amount of substance in 16 grams of oxygen. the number of atoms in 12 grams of carbon. 6.0 x 1023 particles of that substance. 6.2 x 1032 particles of that substance. 6.23 x 10 particles of that substance. 10 x 623 particles of that substance. How many atoms are there in 2.5 moles of Gold (Au)? There are 3 x 1023 molecules in a sample of hydrogen (H2) gas. How many moles of H2 are there in this sample? How many atoms are there in 1.5 moles of sulfur dioxide (SO2)? If the molar volume of a gas at STP is 22.4 litres, how many moles are there in 112 litres of hydrogen gas? a mole of a that substance. the molar mass of that substance. The relative atomic mass of hydrogen is 1, and that of oxygen is 16, and that of sulfur is 32. What is the relative molecular mass of sulfuric acid (H2SO4)? There are 22,400 cm3 in a mole of any gas at STP. How many cm3 are there in 0.05 mole of a gas at STP? The relative atomic masses of sodium, oxygen and hydrogen are 23, 16 and 1 respectively. How many grams are there in 0.5 mole of sodium hydroxide (NaOH)? Which one of the following instruments is used for determining the relative molecular mass of a substance? the mass in grams of 1 mole of that substance. the mass in grams of 1 litre of that substance. the number of moles in 1 litre of that substance. the number of moles in 1 kilogram of that substance. If Avogadro's Number is 6 x 1023, then how many atoms are there in 2.5 moles of hydrogen gas (H2)? If the molar volume of methane (CH4) is 22,400 cm3 and its molar mass is 16 grams, then how many grams of methane are there in 112 cm3 of methane gas? Which of the following expressions is that of the combined gas law? Under what two conditions will a real gas behave like an ideal gas? High temperature and low pressure. Low temperature and low pressure. High temperature and high pressure. Low temperature and high pressure. Which one of the following is NOT an assumption of the Kinetic Theory of Gases? Van Der Waals forces exist between particles in a gas. The average kinetic energy of the particles in a gas is proportional to its absolute temperature. All collisions between particles in a gas are perfectly elastic. The diameters of the gas particles are negligible compared to the distances between the particles. In the equation of state for an ideal gas, which term represents the Universal Gas Constant? The temperature of 1 dm3 of a gas is increased from 2oC to 64oC at constant pressure.